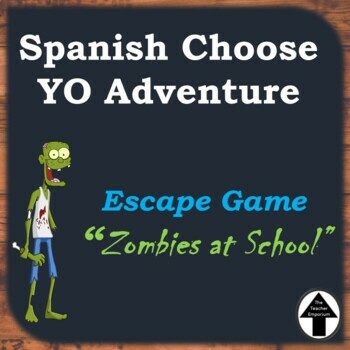 After happening upon a zombie in the janitor’s closet toward the end of the school day, students must quickly begin to make decisions on what to do about it. Each decision they make will lead to a different outcome. Most outcomes in the game lead to them encountering zombies and forces them to start over, However one path allows them to escape. 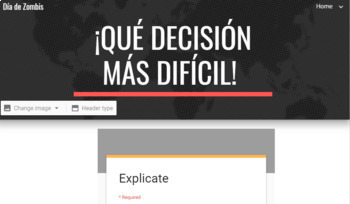 Along the way they will have to read through the Spanish story line and choose their own fate, in between decisions there are also a few google forms that ask them to write out the explanations to their decisions before moving forward in the game. 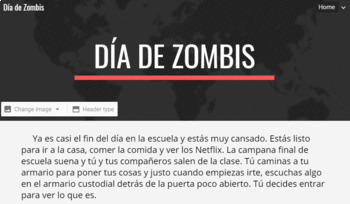 This is a super engaging reading and writing exercise for upper level Spanish 3 or 4. I do not recommend this activity for lower level Spanish classes. Duration is 45-55 mins. **Game requires access to a computer. This is ran on google sites with google forms.